As one of the most spectacular scenic points on the Sunshine Coast, the Glass House Mountains and its national park are a popular tourist destination in Queensland. With the verdant rainforests, adjacent coastline and many adventurous activity options, the Glass House Mountains National Park is a one-of-a-kind destination in Australia. Nestled on a breathtaking landscape just 70 km north of Brisbane, this national park is a gorgeous site in the Sunshine Coast Hinterland. The mountain ranges were named by Captain Cook in 1770, who thought these fascinating ranges resembled the glasshouses or glass furnaces back in his native town of Yorkshire. Easy walks include Mount Beerwah which is a short 200m return walk through eucalypt forest. 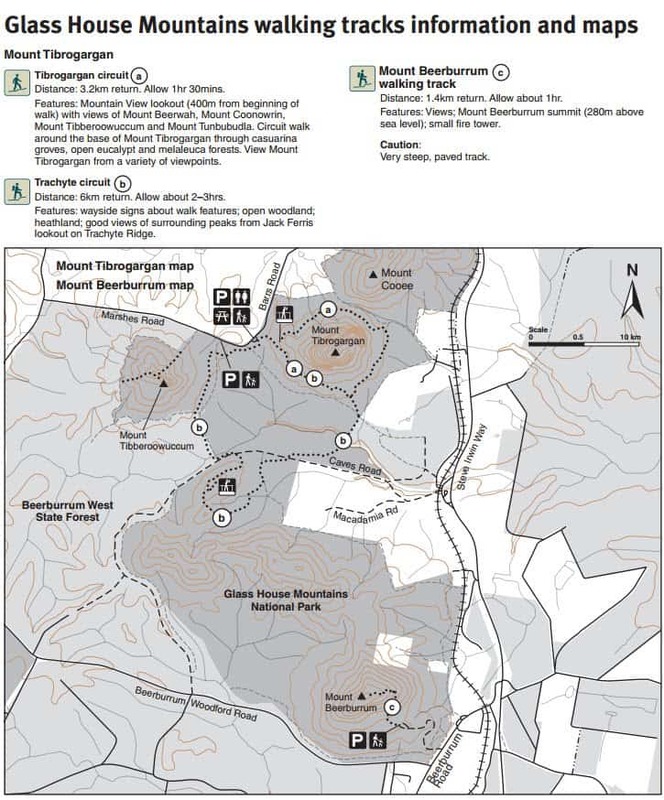 Another is Mount Ngungun summit walking the track with a distance of 2.8kms return. This walk will take approximately 2 hours to complete and you will see an open forest and 360-degree views from the top of Mt Ngungun. Other more difficult summit climbs include Mount Beerwah summit route (2.6kms) and Mount Tibrogargan summit route (equivalent to 50 storeys high). These routes are suitable for people with a high level of fitness, experience and skills in rock climbing. They have steep rocky sections and irregular surfaces with loose stones that require rock scrambling skills. 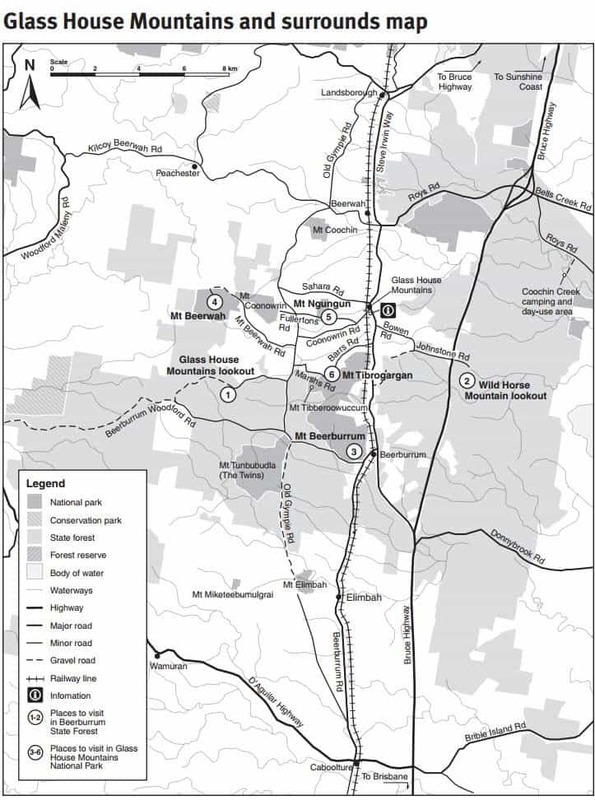 There are no camping areas within Glass House Mountains National Park, however, there is camping at the nearby Beerburrum State Forest at Coochin Creek as well as a number of private camping areas along the Glass House Mountains Road. 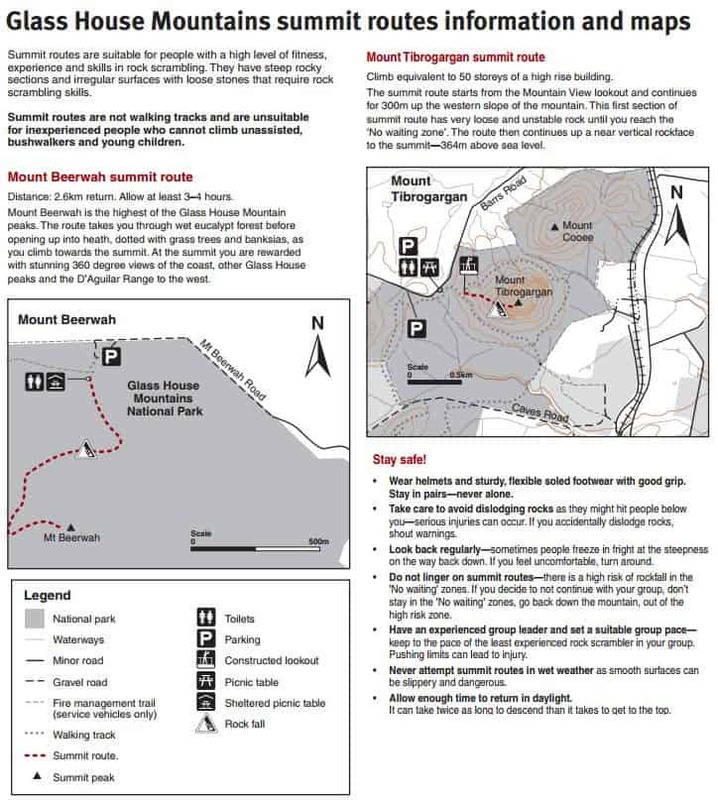 There are picnic tables and toilets at Mount Tibrogargan and Mount Beerwah (a short 100m walk from the car park). Please note that dogs are not permitted within the national park. 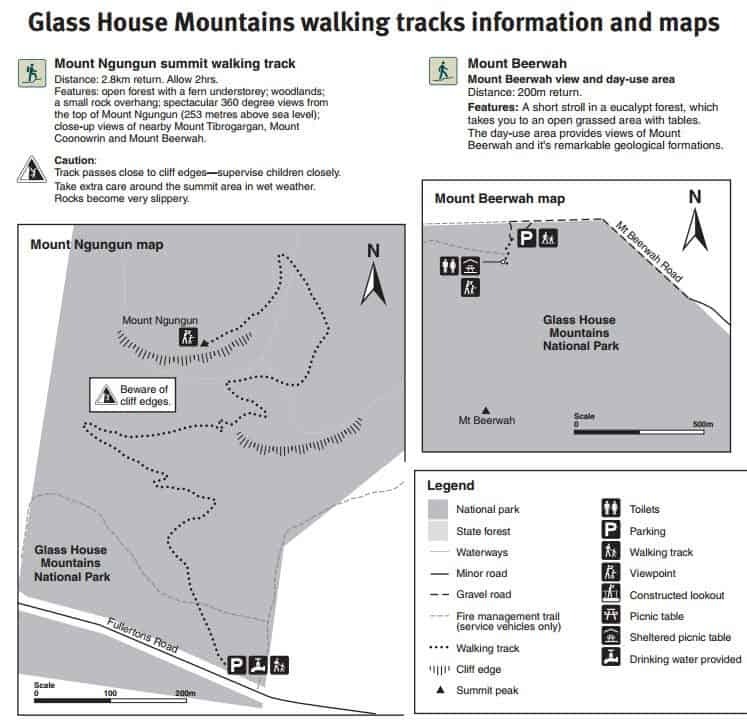 For your safety, it is recommended you visit Glass House Mountains National Park in daylight hours only.